HARTFORD, Conn., May 24, 2017 – On Feb, 19, 2018 on Connecticut Public Television (CPTV), PBS Kids will premiere Pinkalicious & Peterrific (watch a sneak peek here), a new animated series that will encourage children to explore the arts and spark creativity. 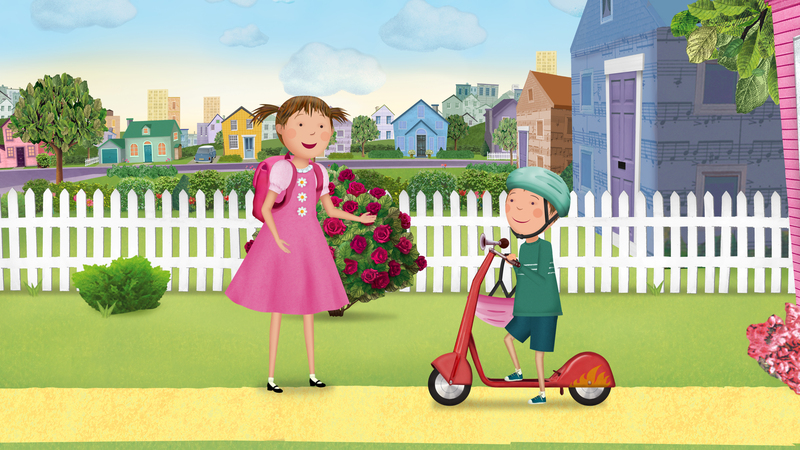 Produced by WGBH Boston and based on the best-selling HarperCollins Pinkalicious book series by Victoria Kann, this new multiplatform media property will be available nationwide, including on CPTV; on the new 24/7 CPTV PBS Kids channel; and on PBS Kids digital platforms. Designed for children ages 3-5, Pinkalicious & Peterrific encourages kids to engage in the creative arts and self-expression, covering areas such as music, dance, and visual arts. Pinkalicious & Peterrific follows the adventures of Pinkalicious and her brother Peter. Pinkalicious imagines creative possibilities everywhere she looks. She is an artist at heart—and, like most creative people, she sees the world differently from others. She knows what she likes, and she’s not afraid to express herself—though she sometimes needs help from Peter and her neighborhood friends. Pinkalicious & Peterrific is designed to help preschool-age children explore the arts and creativity. The new PBS Kids series is based on author-artist Victoria Kann’s number-one New York Times-bestselling Pinkalicious book series, which includes 63 titles and has sold more than 23 million copies to date. The most recent book in the series, Peterrific, debuted in May 2017. The HarperCollins book series has been translated into eight languages, is sold in nine countries, and inspired a stage musical, Pinkalicious: The Musical, which premiered in New York City to sold-out audiences and continues to be performed there and across the country. The Pinkalicious & Peterrific television series is part of a multiplatform media experience that will also include digital content for kids, parents, and teachers, debuting in early 2018. Pinkalicious & Peterrific will offer a variety of games at pbskids.org and on the PBS Kids Games App, as well as clips and full episodes across PBS Kids’ streaming video platforms, including the PBS Kids Video App. A Pinkalicious & Peterrific app will also launch in 2018. Parent resources will be available on the PBS Kids for Parents site, and PBS LearningMedia will offer classroom-ready materials for teachers, including video excerpts, games, tips, and printable activities. Each episode of Pinkalicious & Peterrific will include two 11-minute stories, as well as a live-action interstitial and an original song. The series is currently in production at WGBH and its animation partner, Sixteen South, for 38 half-hour episodes and one hour-long special, which will roll out on PBS Kids beginning in 2018.